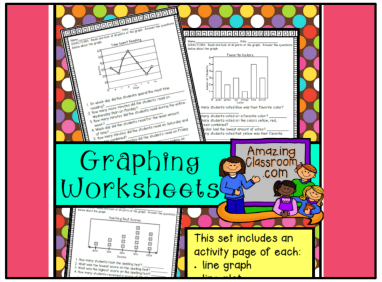 This set of activity pages will help your students become more familiar with line plots, bar graphs, line graphs, and tally charts! This file includes 5 different worksheets and includes their 5 answer keys for easy grading. Students are presented with a graph and then are presented with several questions about the graph. Each worksheet also includes the question, (write one question that can be answered from the graph). Do your students have difficulty writing complete sentences? 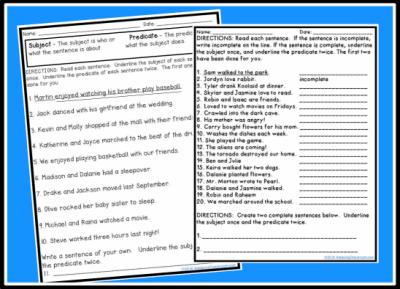 This activity will help students better understand that a complete sentence needs both a subject and a predicate. These two worksheets include a ton of practice. Use this activity as formative or summative assessment, or as guided practice or homework. Enjoy! 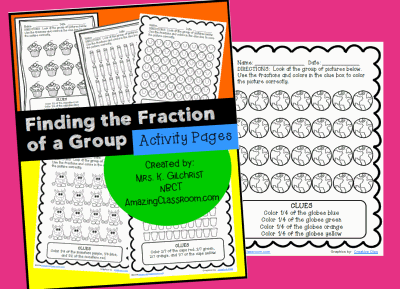 Finding fractions of a group can be a hard skill for students. Let them have extra practice with this concept! This pdf file contains ten activity pages that allow students this extra practice. On each page, the students are presented with an array and a clue box. For example: The array may have 12 cupcakes. The clue box might say, "Color 1/4 of the cupcakes red, 1/4 of the cupcakes green, 1/4 of the cupcakes purple, and 1/4 of the cupcakes pink. 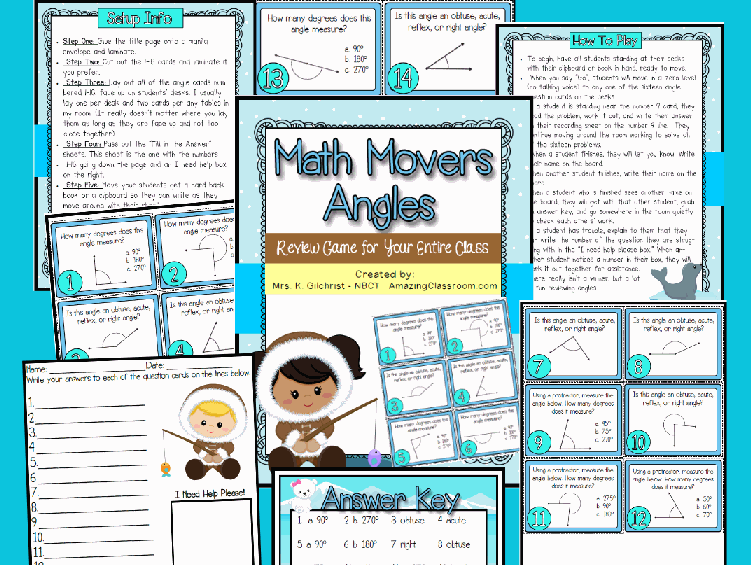 Your students will love reviewing all about angles with this Math Movers Angles Review game.Place sixteen angle question task cards around the room, face up. Your students use their recording sheets and all students walk around to find the answers to all angle questions on each card. Each student is answering sixteen questions about angles. Reinforce math and literacy concepts with this February themed skill sheets set. 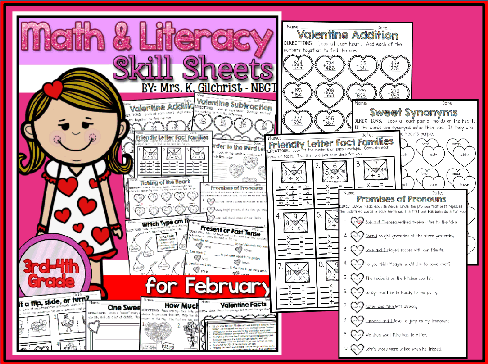 Almost all of the skill sheets are geared toward Valentine's Day, but can be used throughout the whole month of February to review important concepts. This packet is best for 3rd and 4th graders, but could be used for lower 5th graders or higher performing 2nd grade students. All skill sheets come with an answer key to ease teacher grading. Enjoy! 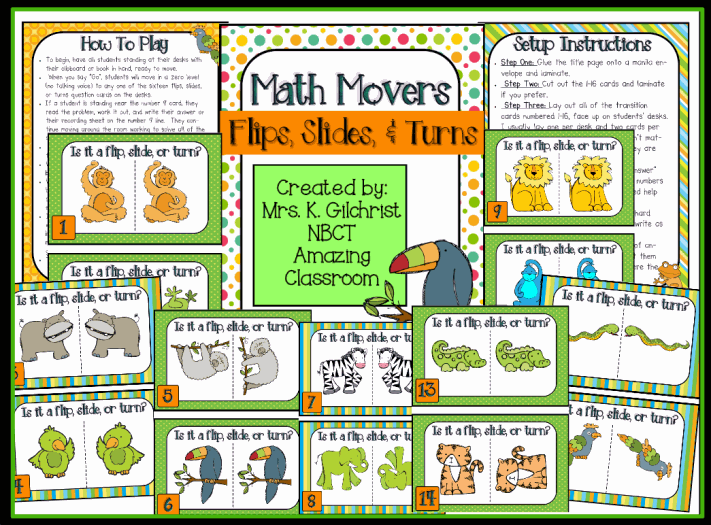 Your students will love reviewing flips, slides, and turns with this fun, math movers, geometry game! Get your students up and moving while reviewing fun math concepts. This game includes a title page, setup page, how to play instructions, sixteen cards, a recording sheet, and answer keys. 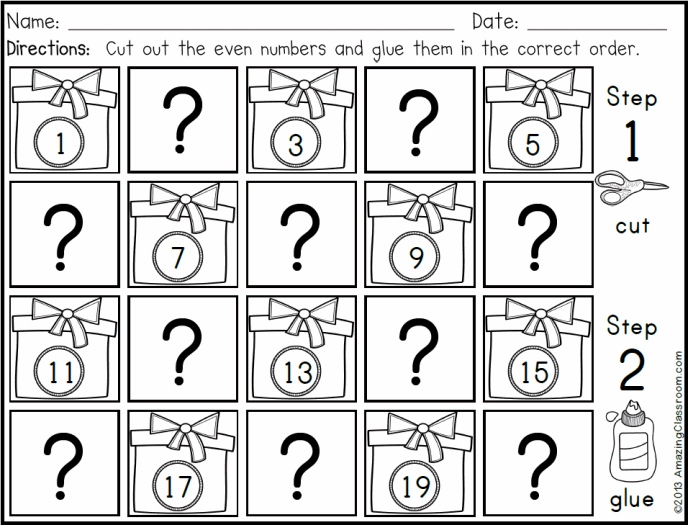 Your students will have fun counting to 20 this holiday with this fun, holiday themed, activity page. Your students will cut out the even numbered presents, and glue them in the correct order. Use this as a formative assessment, guided practice, or as a summative to see if your students have learned from your teaching. This is a pdf file. Enjoy! 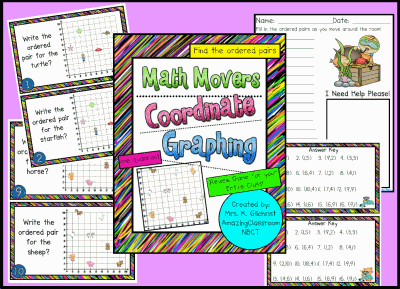 Your students will love reviewing finding ordered pairs in one quadrant with this fun, Math Movers Coordinate Graphing game. This game includes a cover page, setup instructions, how to play directions, sixteen task cards, a recording sheet, and an answer key! Get your students up and moving with this fun, review game for your entire class! Enjoy! What a fun way to review the Three Branches of Government with your entire class! They will love to get up and move while reviewing this fun, yet challenging social studies concept. 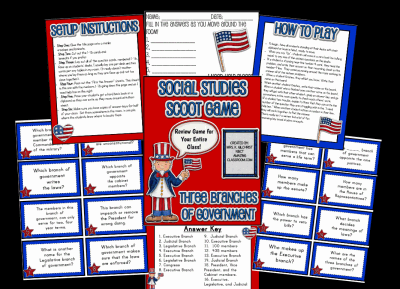 This file comes with a cover page, setup instructions, how to play directions, sixteen questions pertaining to the three branches of government, a fill in the blank recording page, and an answer key. 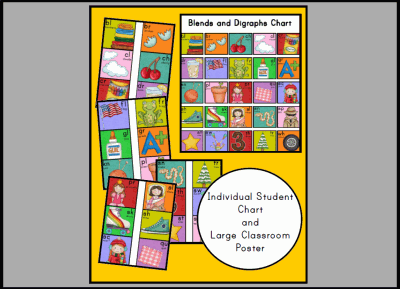 Print out the individual student blends and digraph charts and place in their reading folders, writing folders, to send home, and even in small reading groups. With the larger pictures of blends, cut them apart and glue in order on a poster board or chart paper and laminate. Hang it in your classroom near your small group table, or near your writing center. It will match the small student blends and digraphs chart.